"I CALL MYSELF a natural musician," says singer and composer Ella Jenkins, hailed as the first lady of children's folk songs. "You know, I was always into singing la-la, lu-lu, humming, and whistling--even when it wasn't considered proper for young ladies to whistle," she adds with a hearty laugh. "As a kid, I simply had to go see tap dancers because there was something so very special in the staccato sound of their footsteps." For 45 years, this portly, gentle performer has been drawing on the rhythms of life to create some of the recording industry's most magical--and widely imitated--children's songs. In that time, Jenkins, 77, has taken two generations of tykes on a musical journey bristling with playful rhythms, exotic sounds, and tales of faraway places. 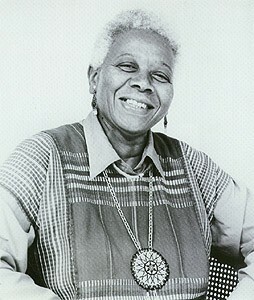 Since the release of her acclaimed 1957 debut, Call and Response: Rhythmic Group Singing (Folkways), the St. Louis native (who lives part of the year in Marin County) has recorded two dozen albums of children's music (all digitally remastered and reissued on the Smithsonian/Folkways label), four teachers' manuals, and two performance videos. Her classic recording You'll Sing a Song and I'll Sing a Song, released 35 years ago, is the bestselling album in the history of the acclaimed Folkways label. On Oct. 14, in recognition of her achievements on behalf of children, Jenkins will receive the Children's Music Network's Magic Penny Award at a ceremony at Walker Creek Ranch in Marshall. The CMN is an international network of teachers, librarians, broadcasters, performers, parents, and children formed in 1986 to communicate songs and ideas about children's music. It is the latest of a long series of similar awards for this humble performer. In 1999, Jenkins became the first woman and the first African American to receive the prestigious ASCAP Lifetime Achievement Award. In 1991, Jenkins earned a Parents' Choice Award for her album Come Play by My Ocean, a wonderful collection of songs about caring for the environment and appreciating other cultures, languages, and places. THESE DAYS, some children's performers (like Shelley Duvall) tend to be flashy, but Jenkins still takes a simple, no-nonsense approach, playing gentle tunes and accompanying herself on a baritone ukulele or tambourine. "There are a lot more people in the field nowadays--some good and others just coming along for the ride because they think it's child-mania," she muses, during a phone interview from her Chicago home. "I guess a lot of performers think children are a pushover. But you should never underestimate young people; they are your strongest critics." A former YMCA teen program director and sociology graduate from San Francisco State University, Jenkins started her own musical odyssey in the rough-and-tumble southside district of Chicago, home to many famous blues musicians. In the early '50s, she began performing in local folk clubs. It wasn't long before the host of a local public-TV show invited Jenkins to create her own musical segment on the children's program. Jenkins brought young students into the studio and featured everything from the sounds of office equipment to the rhythms of the streets (skipping, hopping, and jumping rope) to guest appearances by such folk-blues heavyweights as Big Bill Broonzy and Josh White. Yet it was the innovative use of the call-and-response technique--which she'd first heard in the black churches and the songs of big-band leader Cab Calloway--that brought Jenkins praise from early childhood educators. "I thought it would be a really good way to get across an idea to children, using rhyme to connect with an idea," she says. "The whole idea is that to repeat the sounds, the child has to listen, And for them to listen, of course, you have to fill the song with something interesting. If you really want to capture a child's attention, a song has to be adventuresome, interesting, or maybe a little bit funny." For Jenkins, those songs--often inspired by her travels and the children themselves--are a springboard for the imagination that sparks the curiosity with everything from Dixieland jazz to Maori battle chants. "I share those experiences [of faraway lands] with the children because many of them will never travel beyond their own community," she explains. "But I can help them travel through my songs." And what does she get in return? "Oh, my goodness," she says with a laugh, "I feel youthful, excited, and alive because even though the children change over the years, there's something very basic in their innocence. And so long as you play it square with them and show real interest, they'll give you their undivided love and trust. "And that's kept me going." To register for the Children's Music Network gathering, visit their website at CMNonline.org or call 707/878-2415. From the October 4-10, 2001 issue of the Northern California Bohemian.